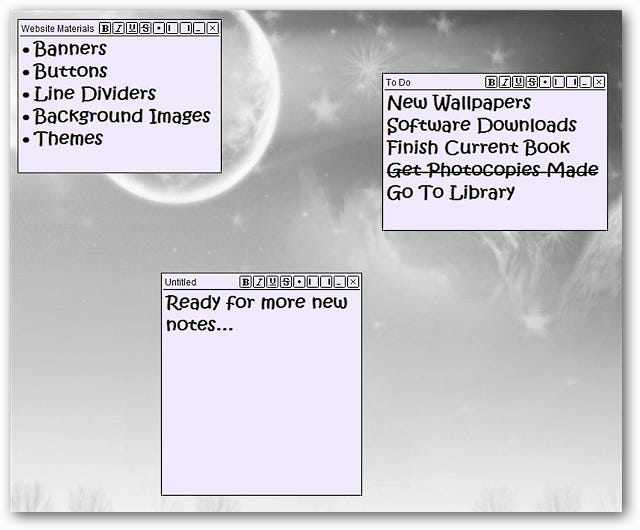 Wanting an unobtrusive way to keep sticky notes on your desktop? 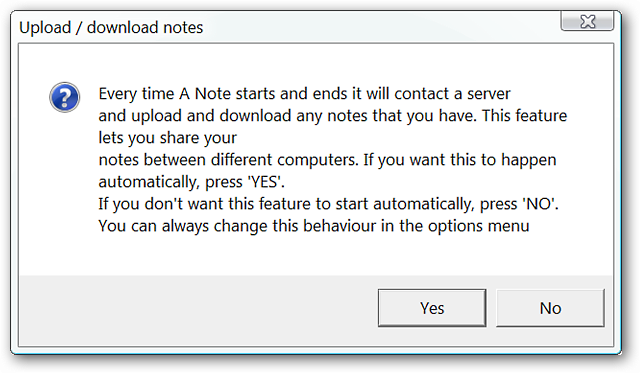 Then “A Note” just might be the program that you have been looking for. Installation for “A Note” is quick and straightforward. Once you have finished the installation you will be presented with the following message window. 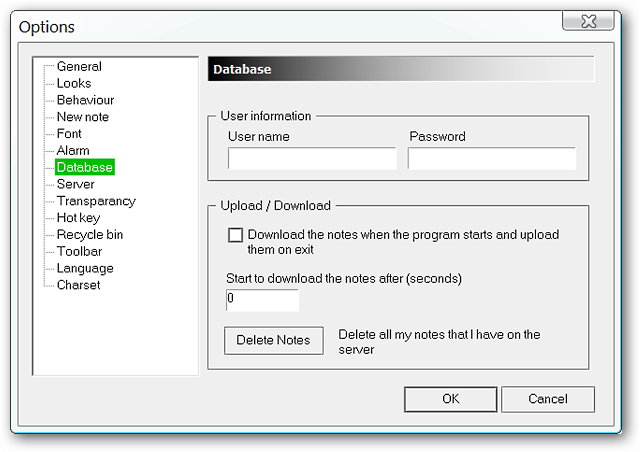 You can choose to enable server synchronization for your notes if desired (click “Yes”)…for our example we chose to keep everything locally stored on our system (click “No”). 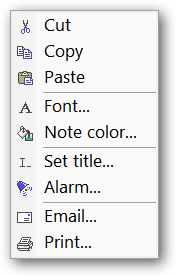 Once you have sorted through the options and set the preferences to suit your needs, just use the “Right Click Menu” for the “System Tray Icon” to add new notes or manage your current ones. Here you can see three notes on our desktop…the individual notes can be named and the toolbar expanded with extra commands. Note: Images can not be added to these notes. This is how they look when “Minimized”…ready when you need them but definitely out of your way at the same time. 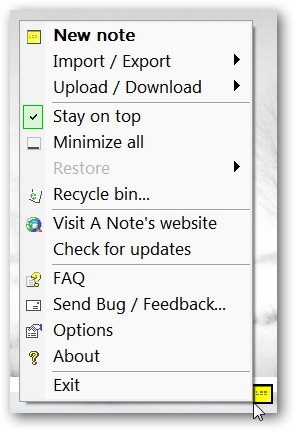 This is the “Right Click Menu” for the notes. 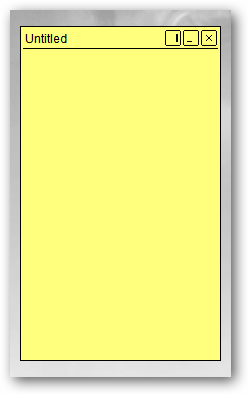 This is the warning message that you will see whenever you delete a note. “A Note” has the wonderful ability to allow you to retrieve accidentally deleted notes (unless the feature has been deactivated in the options). The options for “A Note” have been broken down into “micro categories” to help you focus quickly on the exact category that you are wanting to modify. 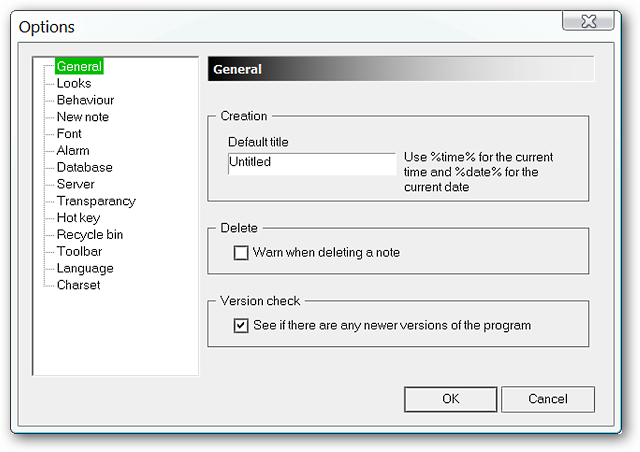 Set default titles, enable/disable deletion warnings, and activate/deactivate version checking in the “General Area”. 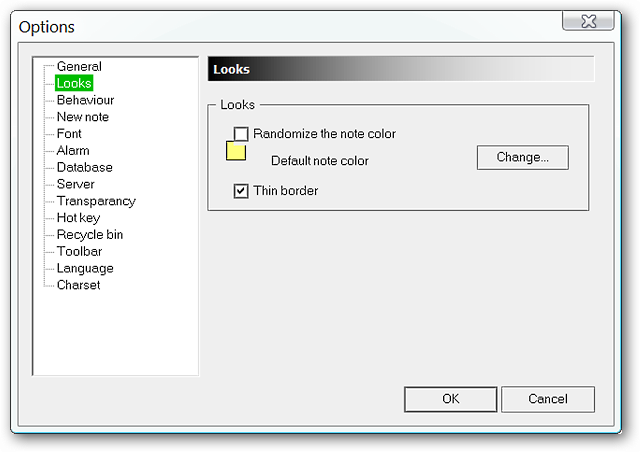 Go with a randomized or specified note color scheme with or without borders in the “Looks Area”. 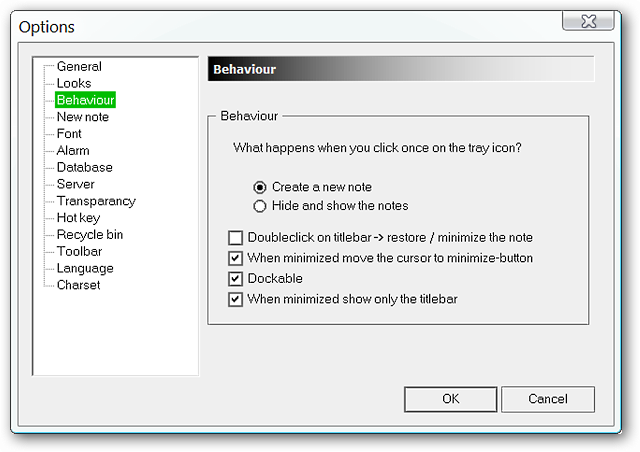 Choose desired behavior for your notes in the “Behaviour Area”. 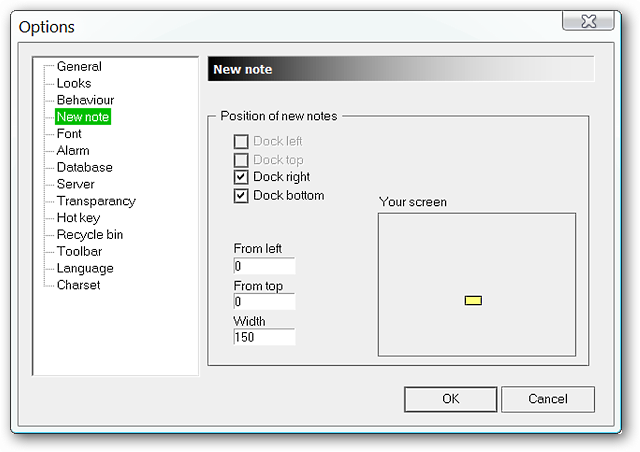 Select the exact area of your screen for new notes to appear and the desired width in the “New Note Area”. 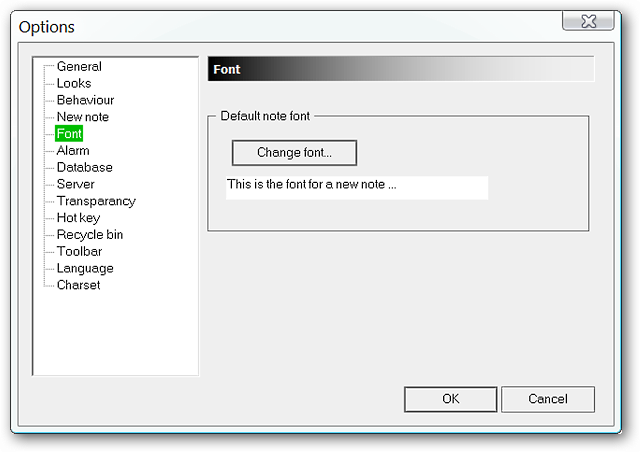 Specify the font and size/style that you want to use in your notes in the “Font Area”. 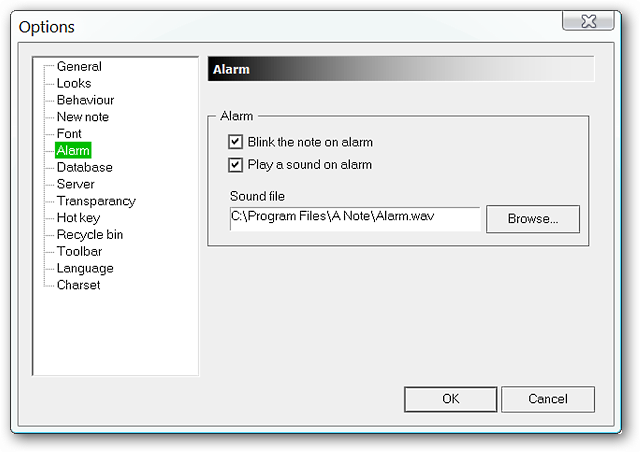 Activate/deactivate the alarm settings and choose the alarm sound file for notes in the “Alarm Area”. 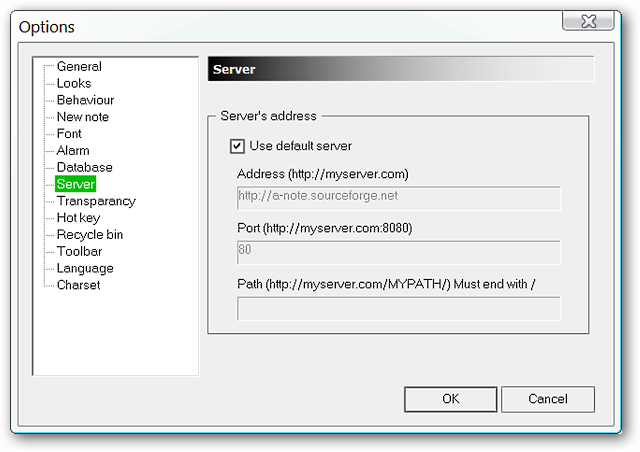 Set up your database and server settings (if desired) in the “Database and Server Areas”. 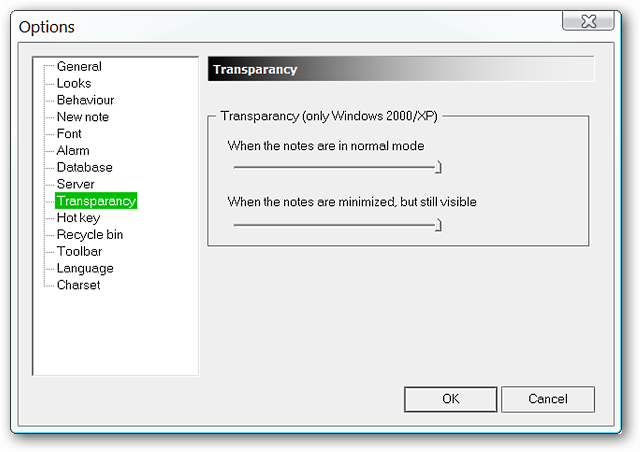 Set the level of transparency that you would like to use in the “Transparency Area”. Even though it says for Windows 2000 or XP only we were able to use the Transparency function without problems on our Vista system. 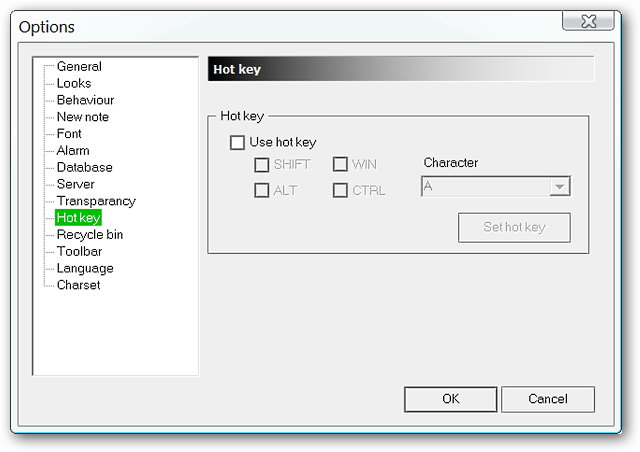 Set up basic hotkey commands in the “Hot Key Area”. 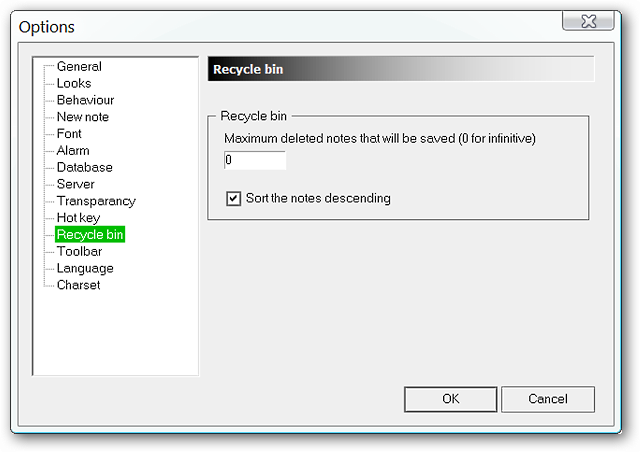 Specify the amount of deleted notes to be retained in the “Recycle Bin Area”. It is recommended to leave the default setting as is if you are worried about any accidental (or regretted) deletions. 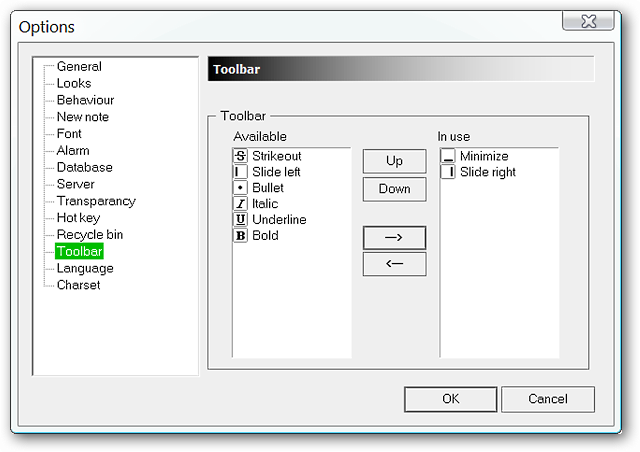 Add or delete commands from the “Notes Toolbar” on your notes in the “Toolbar Area”. 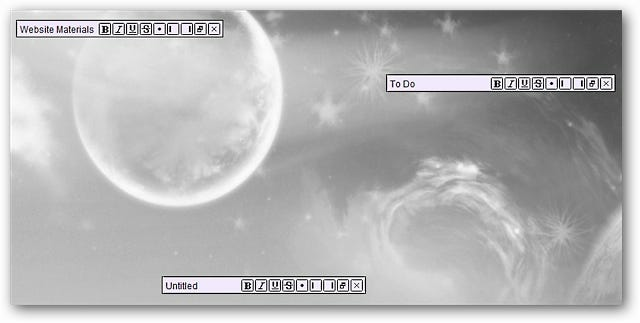 You can also set a specific order for the commands to appear in based on your particular needs. 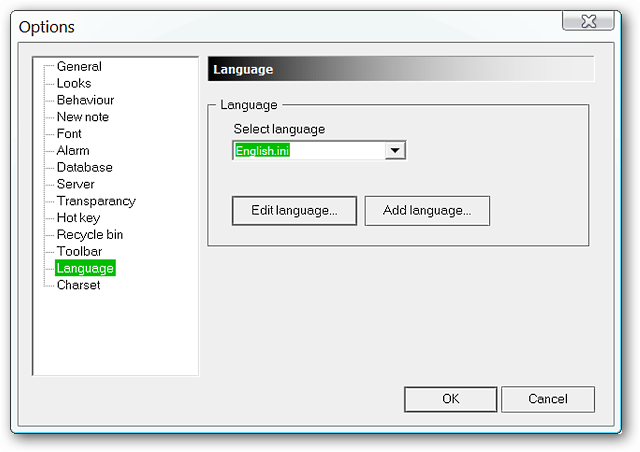 Set the default language in the “Language Area”. 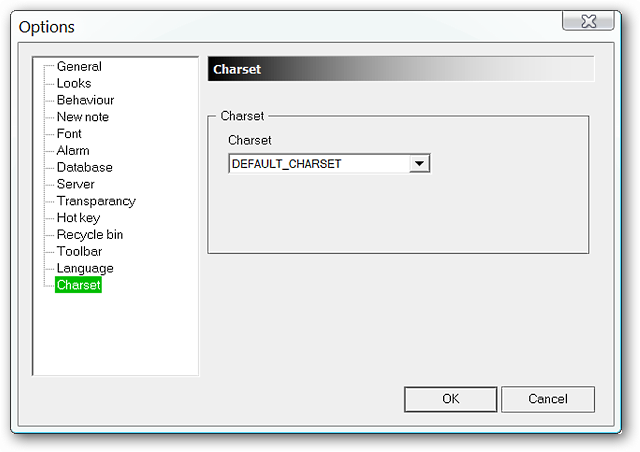 Choose the particular Charset that you need in the “Charset Area”. 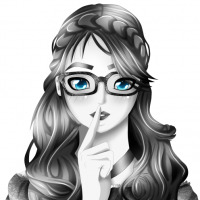 “A Note” may not be the most glamorous looking sticky notes program available, but it is certainly capable of getting the job done and getting it done right. From the author “A Note is faulty. Do not use it anymore! It will do more bad than good. Your notes may just disappear.